Custom sizes available, please email us at sales@whitelotushome.com No size is too big, odd or small. We will soon also include them as a set soon. If you need help in placing your order, please call 732-828-2111 or email us at info@whitelotushome.com. Yes, the covers for pet beds can be removed to be washed. What are your dog beds filled with? 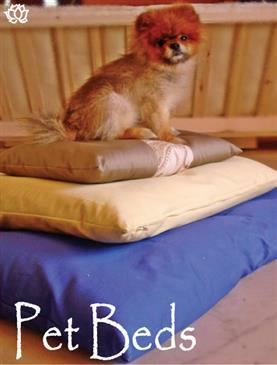 Pure Cotton, either USDA certified Organic or Green Cotton (conventionally grown).